BRAND: After 10 years of technical boot fitting experience, the founders at Le Bent launched a mission to design the ultimate ski sock. Countless prototypes, dedicated product testing and refinement, and an unending search to source the best materials and mix them in the perfect blends….and Le Bent has made its mark on the skiing world forever. 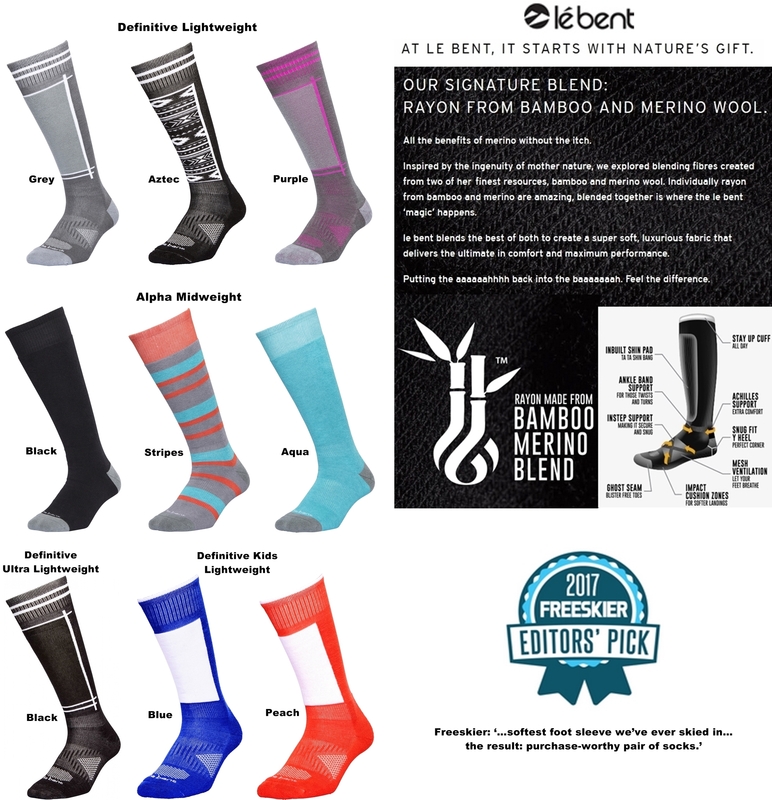 Originating in Australia with ski socks, Le Bent has expanded its product line and its market presence as a worldwide premium ski apparel company selling award-winning gear for all winter enthusiasts. SOCKS: Choose from Definitive (Light to Midweight, Le Bent's most popular sock), Definitive Ultra (high performance, low volume, lightweight sock for precision boot fits), Definitive Kids (same as the Definitive, available in smaller sizes for kids) , or Alpha (a scaled down version of the technical Definitive, this basic sock features consistent midweight thickness). Le Bent socks feature The Definitive Fit System: specially designed elastics in strategic zones for a superior fit and Le Bent's signature blend of Bamboo, Merino, Nylon, and Elastane/Spandex. CONDITION: These PAIRS of socks are brand new with tags. RETAIL PRICE: $30 (Definitive), $26 (Definitive Ultra and Alpha), and $19 (Kids). COLOR: Choose from remaining available colors. SIZE: Choose from remaining available sizes. Sizes are stated in USA shoe sizing. Adult sizes are XL for Men 12-14.5, Large for Men 9-11.5 and Women 10-12.5, Medium for Men 6-8.5 and Women 7-9.5, and Small for Youth 3-5.5 and Women 4-6.5. And Kids sizes (not shown on size chart) are Large for Kids 3-6, Medium for Kids 12-2.5, and Small for Kids 9-11.5.